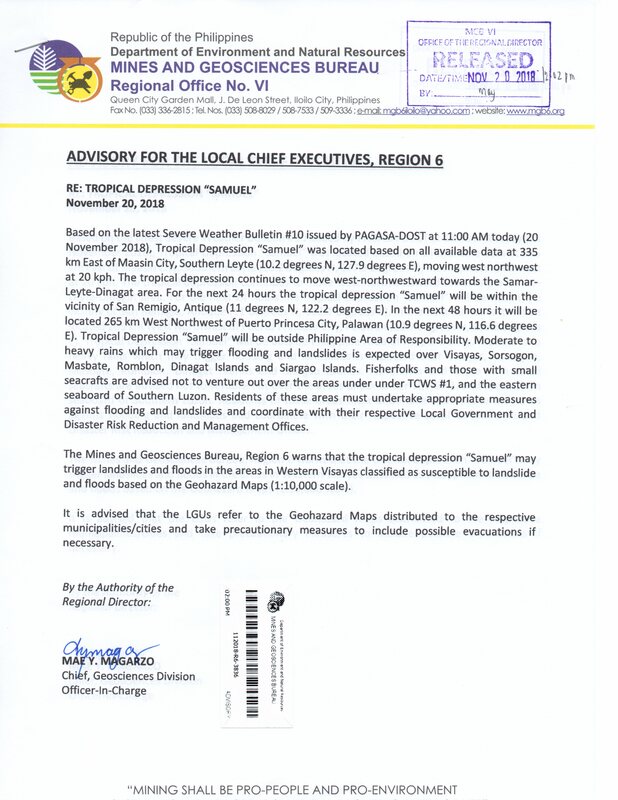 Iloilo City –The Department of Environment and Natural Resources, Mines and Geosciences Bureau Regional Office 6 (DENR, MGB RO-6) issues an advisory to warn the local government units of Region 6 of possible landslide and flood when a typhoon is forecasted by the Philippine Atmospheric, Geophysical and Astronomical Services Administration (PAG-ASA) to hit Western Visayas. 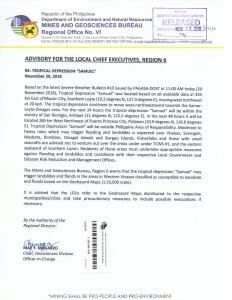 In the advisory, MGB RO-6 warns communities in areas that are susceptible to landslides and floods to take precautionary measures and prepare for evacuations if necessary. Today, tropical depression Samuel is forecasted to pass through the vicinities of Iloilo, Negros Occidental, Guimaras, Capiz and Antique in the next 48 hours. (See Advisory). The geohazard maps of MGB shows the barangays that are classified in their susceptibility to landslides and flood – from low, moderate, high and very high susceptibility. Prolonged rains may trigger landslides and floods to occur in areas that are highly susceptible to these natural hazards. The MGB RO-6 as a member of the Regional Disaster Risk Reduction and Management Council of Western Visayas provides data on geohazards during the Pre-Disaster Risk Assessment (PDRA) Meetings called by the Office of the Civil Defense (OCD).